Crippled zombies are zombies nonetheless. Photo courtesy of Gabriel Harbour. Some of them can be as vicious as dogs if let out of the straightjacket. I’m going to put this sign on my gate. That will keep salesman away. 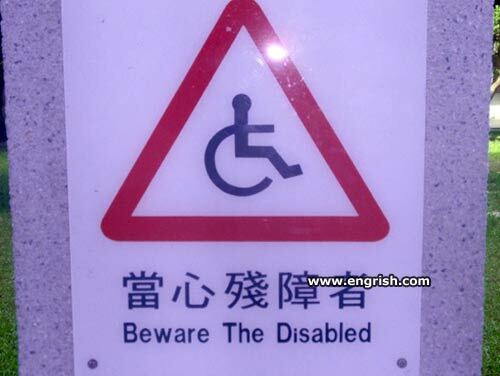 I’d be careful of their wheelchairs too. It’s got a mean kick too. The blind drivers are the worst. Appropriate sign for a mental hospital. Especially the ones with long, curved tails, apparently. Latest game app: The wheelchair dead! Beware the powered wheelchairs run here. Ahm de Jamacian bobsled team mon. They never apologize for the incontinence! You don’t want to end up as wheelchair roadkill. Why is that man in the wheelchair wearing a hockey mask? That just gave me an idea for an egregiously non-PC, but totally hilarious, survival-genre video game. If you ever want to see ninety year olds with walkers riot. Announce at breakfast: bingo is cancelled! Can’t you tell, they’re all evil universe-conquerering SOBs like Davros.